Because air conditioners tend to run hard during spring and summer in metro Phoenix, we’d like to share a few tips to help lessen the stress put on your AC’s operating system. Air conditioners can overheat when they work too hard and they must overcompensate when too much heat accumulates in the home. You can take action to help reduce the amount of internal heat generated in your home from taxing your AC operations. Check your attic and be sure there is proper insulation to keep your AC running efficiently to cool the home. To keep your home cooler and reduce utility bills, add insulation if needed. Keep windows and doors closed during the heat of the season. Use window coverings to block the harsh sun from heating the inside of the house. Operate electronics, lights, small appliances, stoves, dishwashers, washers and dryers only when you need them and during cooler times of the day. This helps reduce the amount of heat generated inside the home. Instead of using the stove all the time, use the outdoor grill instead. It’s a good way to reduce the indoor temperature. Commit to regular air conditioning maintenance, and have AC repairs handled quickly, and be sure to change your air filter monthly to keep your home cool and comfortable through the heat of the season. The holiday season is certainly the busiest travel time of the year. Since so many leave home to visit family, friends or take a vacation, we would like to provide helpful tips for keeping your home safe and operating efficiently during your time away. HOME AUTOMATION – With a home automation system, your travels can be much easier than in times past, you can save energy too. It is more convenient and efficient to control lighting, AC/heating, door locks, garage door, window coverings, and more – and it’s all at your fingertips. You can have direct control of your home from your smart device. It’s worth checking into a system like this. LIGHTS ON – An automatic timer or use of a home automation system to turn lights on and off while you’re gone can save energy, and provide an indication that someone is at home. WATER HEATER – The water heater is often overlooked, and you can save energy by turning it to its lowest setting while gone. Some like to shut off the water at the meter until they return home. HEATING AND COOLING – When it comes to your heating and cooling system, set your thermostat at 55 f or 85 f, depending on the season, to keep the house maintained. There’s no reason to warm or cool a house when no one is home. UNPLUG – Walk through your house and unplug all electronics, appliances, and garage door openers that do not need to be on while you’re gone. This will save $$ on your energy bill and help protect against potential fire damage. Avoid the “energy vampires” that zap energy when appliances, lamps, and other electronics are plugged in when they don’t need to be. These tips can help prevent fire hazards, water damage, help protect your home and valuables – and save on utility costs. From Marlin Services, we wish you a wonderful holiday with family and friends! Count on us for your residential, commercial, or new construction plumbing services. Call us anytime at 602-470-1040. We are here for you 24/7. During the holidays and every day, tis the holiday season for giving. Many of us are fortunate and able to share with those who need a helping hand. At Marlin, we have special holidays like Thanksgiving, Christmas, and Easter dedicated to special community giving by donating hams and turkeys to those in need. It is from our hearts that we participate, and it is with great hope that we all make a difference in the lives of many. Matthew’s Crossing Food Bank is one of our Charities of Choice, and we ask you to join Matthew’s Crossing in Uniting Our Community In The Fight Against Hunger. Marlin will again deliver 100 Turkeys for Christmas distribution on December 22, 2015. Marlin Mechanical Corporation/Marlin Services is pleased to help “fill the plates” again this Thanksgiving by donating 100 turkeys to Matthew’s Crossing Food Bank of Chandler. Matthew’s Crossing is a non-profit organization and a charity of choice for Marlin Services. Marlin is most humbled to help in the fight against hunger. Norm Sanders of Marlin Services delivered the truckload of turkeys Friday, November 20, 2015. The donation was received by dedicated volunteers of Matthew’s Crossing, and the turkeys fed local families this Thanksgiving. Call us at 602-470-1040. We are here for you 24/7. AC/Heating system tune-ups help prevent costly repairs and early identification and repair of minor issues before they turn into big problems. Additionally, they extend the life of the unit, and many homeowners don’t realize the manufacturer warranty could become invalid if the unit is not serviced twice per year. Seasonal maintenance is worth the small investment for your comfort, the best equipment performance, and longevity of your system. Have the professionals at Marlin Services tune up your heating/cooling system now that the weather has cooled down. Take care of your heating and cooling system, and it takes care of you. when it comes to proper equipment maintenance. Call us at: 602-470-1040. We are here for you 24/7. Do you know the busiest day of the year for most plumbers is the day after Thanksgiving? As you know, most families prepare large meals during the holiday weekend for family and house guests – it’s a time when most homes get much more use than normal. With the additional wear and tear in your kitchen and bathrooms, it’s a busy time when plumbers are out clearing pipes, unclogging toilets, repairing garbage disposals and working on water heaters. At Marlin Services we wish you a wonderful holiday with family and friends! call us anytime at: 602-470-1040. We are here for you 24/7. After an active summer of heavy rains and thunderstorms in Greater Phoenix, fall is upon us. This is a perfect time to take inventory around the house. We recommend you check that your home’s operating systems are working at maximum efficiency, that they are clean and clear of obstructions, and that you have regular maintenance on your AC/Heating system, Plumbing, and appliances. It is a good practice to check and maintain your home season by season for optimal comfort, energy savings, and longevity of your operating systems and appliances. Marlin Services is here to help with your AC/Heating and Plumbing maintenance as needed. It is recommended to have regular maintenance once or twice per year. 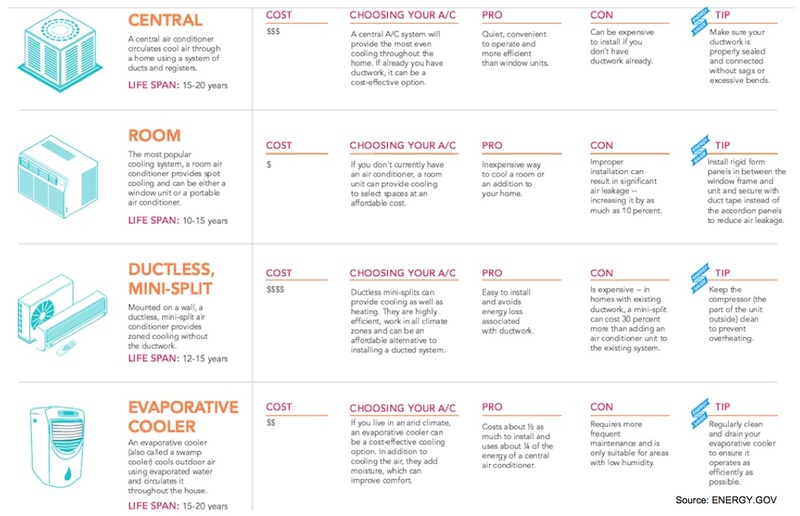 For those needing a new air conditioner, we want you to know the various types of units available today. When selecting the best unit for your home and lifestyle, consider these options listed in the chart below. Of course with all the latest technology, the new energy-efficient air conditioning systems can SAVE you 20-50% in energy compared to the older models. Before finalizing your choice of air conditioners, it is a good idea to discuss this with your Marlin Services technician for professional sizing and installation that fits the needs of your family. Do you think about the indoor air quality in your home and how it can affect you and your family? Here’s an article we want to share with you in an effort to keep comfort and health top of mind. 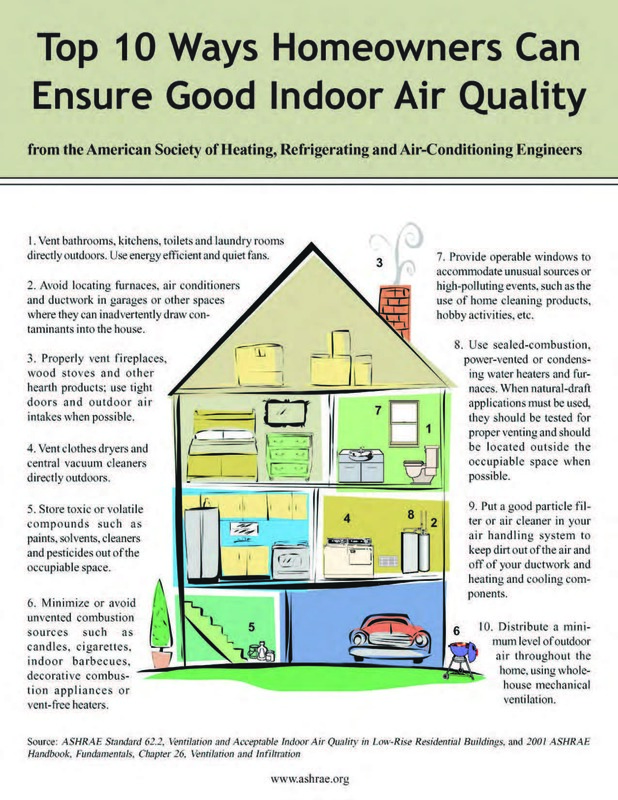 Your indoor air quality can affect your health and comfort in a number of ways, and it can contribute to the development of asthma infections, asthma, and other serious issues. Hope you find these tips helpful in keeping you and your family breathing well every day. We all know water is a precious resource and especially in the desert, where we live. Water is essential to our everyday lives. That said, it is important that we do our part in conserving and protecting our water supply. Look at our neighbors in California who are experiencing many hardships due to scarcity of water. In Greater Phoenix, outdoor water use accounts for approximately 70% of our household water use. Swimming pools can lose up to 15,000 gallons of water every year due to evaporation. Cover your pool when it is not in use to save on evaporation. Check your pool for leaks and repair them quickly. Conserve water with a variable-speed pool pump. Careful not to let excess water run from faucets and showers. Reuse water from cooking and rinsing. Wash fruits and vegetables in a pan of water, rather than running excess water from the tap. Water houseplants or outdoor plants with re-purposed water from the kitchen and bath. In the bathroom: showers, toilets and faucets can waste up to 30% of indoor water. Conserve on the amount of water you run while showering and washing in morning and evenings. It all adds up. Install water-efficient faucets, shower heads and toilets. Take shorter showers and use less bathwater in the tub. You can collect cold bath water or shower water for watering plants. In the laundry room, older washers can use up to 50 gallons of water, and newer Energy Star washers only use 18-20 gallons per load. Adjust water level to the size load for greater efficiency. Wash clothes in cold water for energy savings. Check washing machine hoses for leaks and replace them immediately. Now, these water-saving tips are easy enough for us to each go out and make a difference. Count on us for your Plumbing Repairs – Call the professionals. Many of us have experienced low water pressure or what is known as low flow in the home plumbing system, and it can be a real hassle. Daily activities, like showering, washing dishes, and doing laundry can be frustrating and can take extra time to complete when water flow is significantly slowed. Leaks in a home’s plumbing system can naturally affect and reduce the water pressure throughout a home, due to the interruption of water flow as a leak pulls water from the system. Debris buildup occurs in the form of sand, dirt, and other pollutants and can enter the pipes of your home or business when a water main fractures. As water travels through a building, mineral buildups naturally occur in pipes from water deposits. Even small amounts of sediment can create a blockage in your home’s plumbing system. One way to address this is to clean the screen on the faucet aerators. Steel and galvanized water pipe systems have a life expectancy of up to 20 years. Over the years, a pipe’s natural corrosion tends to block the flow of water in every system. There are times when your water flow issues have nothing to do with water pressure at all, and it might have nothing to do with your own piping system. It could be caused by a malfunction in your area’s municipal water supply. Municipal water supply systems are subject to leaks, buildups, and other issues that affect the water supply and water pressure. Your water softener is another place to look when there is low water pressure in the home or office. 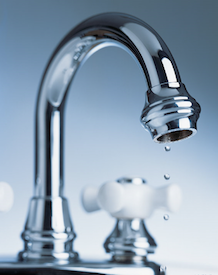 Water softeners can fail and backwash water softener resin beads throughout a home’s water pipes. As you can imagine, this can become a huge mess in the plumbing system as it can plug faucets, ruin toilet supply valves, and affect major appliances. A sudden drop in water pressure is a good indication the water softener is the culprit. 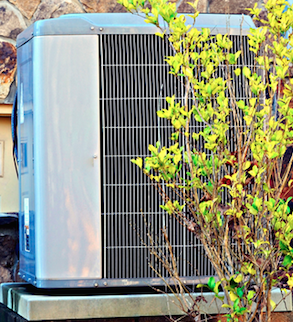 One item many home and business owners often overlook is the outside air conditioning unit on the ground. The efficiency of the system’s operations can be directly affected by its surroundings: shrubs, trees, walls, fences and other obstructions. An AC unit depends on proper airflow for its peak performance. It’s a good practice to occasionally check that your air conditioning unit is clear, clean, and safe for operating efficiently. Whether you have an air conditioner, condenser, or heat pump, be sure there is adequate clearance around the outdoor equipment for ventilation. Below are considerations for proper planning and maintenance around your AC equipment. While plants and shrubbery help hide AC equipment from view and offer shade for the system, be careful that they are trimmed and well kept, so as not to obstruct the efficient airflow and operations of the AC unit. Whatever shrubs and plant life are around the AC unit, they should be maintained and trimmed regularly to prevent overcrowding and obstruction around the unit. Keep this area clean and clear of shrubs and debris that can restrict airflow around the unit. Building walls and fences around your AC unit is an easy solution for protecting the equipment from the elements, like blowing debris and dirt. Walls and fences can also hide unsightly equipment and provide the proper space for air to flow. Air conditioning units need airflow to freely enter and pass through the coils for most effective performance. Check outside every now and then to ensure your AC unit is clean and clear.